Composers Now is pleased to announce the launch of its innovative new initiative, Dialogues, hosted by Composers Now Founder/Artistic Director Tania León. Events in the series open with inspiring performances followed by thought-provoking town hall-style conversations, a forum for meaningful exchanges of ideas between composers, performers and audiences. Read the full press release here. Composers Now, Steinway, ASCAP, and The ASCAP Foundation co-presented Dialogues on Friday, November 30, 2018 at 7:30pm. This evening featured composers Courtney Bryan (New Orleans, US), Felipe Lara (Brazil, US), and Žibuoklė Martinaitytė (Lithuania, US) with conversation catalysts Timo Andres, Marcos Balter and Hannah Selin, hosted by Composers Now Founder/Artistic Director Tania León. Courtney Bryan, a native of New Orleans, La, is "a pianist and composer of panoramic interests" (New York Times). Her music is in conversation with various musical genres, including jazz and other types of experimental music, as well as traditional gospel, spirituals, and hymns. Focusing on bridging the sacred and the secular, Bryan's compositions explore human emotions through sound, confronting the challenge of notating the feeling of improvisation. Bryan has academic degrees from Oberlin Conservatory (BM), Rutgers University (MM), and Columbia University (DMA) with advisor George Lewis, and completed an appointment as Postdoctoral Research Associate in the Department of African American Studies at Princeton University. Bryan is an Assistant Professor of Music at Tulane University's Newcomb Department of Music, and serves as a board member of the Musical Arts Society of New Orleans (MASNO), Composers Now, and New Music USA. Bryan's work has been presented in a wide range of venues, including Lincoln Center, Miller Theatre, Symphony Space, The Stone, Roulette Intermedium, La MaMa Experimental Theatre, National Gallery of Art, Blue Note Jazz Club, Jazz Gallery, Bethany and Abyssinian Baptist Churches, and Ojai Music Festival. Upcoming commissions include compositions for the Jacksonville Symphony, Quince Contemporary Vocal Ensemble, Ensemble Pi, Aperture Duo, Davóne Tines, and collaborations with writers Sharan Strange and Ashon Crawley, and artists Amy Bryan, Alma Bryan Powell, and Tiona McClodden. She has two independent recordings, "Quest for Freedom" (2007) and "This Little Light of Mine" (2010). Praised by the New York Times as "a gifted Brazilian-American modernist" whose works are "brilliantly realized," "technically formidable, wildly varied," and possess "voluptuous, elemental lyrics," Felipe Lara's work—which includes orchestral, chamber, vocal, film, electroacoustic, and popular music—has been commissioned by leading soloists, ensembles, and institutions such as the Arditti Quartet, Brentano Quartet, Claire Chase, Conrad Tao, Donaueschinger Musiktage, Duo Diorama, Ensemble InterContemporain, Ensemble Modern, Helsinki Philharmonic Orchestra, International Contemporary Ensemble, Los Angeles Philharmonic, and São Paulo Symphony Orchestra, and also performed by the Ensemble Recherche, Ilan Volkov, JACK Quartet, KNM Berlin, Mivos Quartet, Netherlands Radio Philharmonic, Nouvel Ensemble Moderne, Peter Eötvös, Steven Schick, and Tanglewood Music Center Orchestra. His compositions have been presented by Aspen Music Festival, Centre Acanthes (France), Acht Brücken Festival (Germany), Aldeburgh Music Festival (UK), Ars Musica (Belgium), Art Institute of Chicago, Aspekte Festival (Austria), Budapest Music Center, Carnegie Hall Neighborhood Concerts, Darmstadt, Donaueschinger Musiktage, Frankfurt Musikfest, Huddersfield, Lincoln Center's Mostly Mozart, Philharmonie de Paris, and Tanglewood's Festival for Contemporary Music, TimeSpans, to name a few. Lara holds a B.M. in music composition and film scoring from Berklee College of Music, an M.M. in composition from Tufts University, and a Ph.D. from New York University. Lara was also a fellow at the Radcliffe Institute for Advanced Study at Harvard University. He is Associate Professor at Boston Conservatory, Faculty at Johns Hopkins University's Peabody Institute, and Lecturer at Harvard's Department of Music. Ms. Martinaitytė's A Thousand Doors To The World was commissioned by the Lithuanian Radio to celebrate Vilnius being named the Culture Capital of Europe in 2009. The premiere was broadcast by Euroradio to an audience of 4 million. Her US commissions include the MATA, Look+Listen and Other Minds festivals as well as the Barlow Endowment. Žibuoklė has received residency fellowships from the MacDowell Colony, the Aaron Copland House, the Millay Colony, Harvestworks, Djerassi and the Cité des Arts (Paris). Her recent projects include an hour-long multimedia piece "In Search of Lost Beauty," scored for piano trio, electronics, and video projections to be released on Starkland in 2019 and a solo CD "Horizons" of orchestral and large ensemble works, released in 2017 by LMIC. Composers Now and the Americas Society co-presented Dialogues No. 3 on December 6, 2017. This third Dialogues event featured renowned composers Zosha Di Castri (Canada), Pauchi Sasaki (Peru, Japan) and Miguel Zenón (Puerto Rico) with conversation catalysts Martha Mooke, Du Yun and David Bridges, hosted by Composers Now founder/Artistic Director Tania León. Continue reading for more details on this exciting event celebrating living composers. Zosha Di Castri is a Canadian composer/pianist living in New York.Her work (which has been performed in Canada, the US, South America, and Europe) extends beyond purely concert music including projects with electronics,soundarts, and collaborations with video and dance. She has worked with such ensembles as the San Francisco Symphony, Montreal Symphony Orchestra, the National Arts Centre Orchestra, the L.A. Philharmonic, the Chicago Symphony Orchestra, the International Contemporary Ensemble, Wet Ink, Ekmeles, Nouvel Ensemble Moderne, and Talea Ensemble among others. Zosha is currently an Assistant Professor of Music at Columbia University. 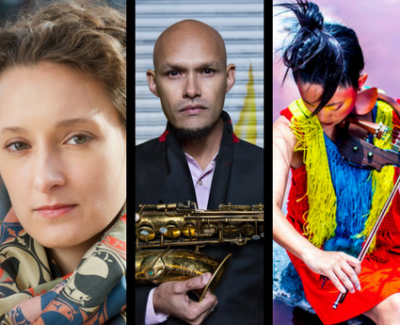 Multiple Grammy Nominee and Guggenheim and MacArthur Fellow Miguel Zenón represents a select group of musicians who have masterfully balanced and blended the often contradictory poles of innovation and tradition. Widely considered as one of the most groundbreaking and influential saxophonists of his generation, he has also developed a unique voice as a composer and as a conceptualist, concentrating his efforts on perfecting a fine mix between Latin American folkloric music and jazz. Born and raised in San Juan, Puerto Rico, Zenón has released nine recordings as a leader, including the Grammy-nominated Alma Adentro (2011) and Identities Are Changeable(2014). As a composer, he has been commissioned by SFJAZZ, The New York State Council for the Arts, Chamber Music America, The John Simon Guggenheim Foundation, Peak Performances, PRISM Quartet, and many of his peers. Zenón has given hundreds of lectures and master classes at institutions all over the world and is a permanent faculty member at New England Conservatory of Music. Composers Now and the Baryshnikov Arts Center co-presented Dialogues No. 2 on November 1, 2016. This second Dialogues event featured renowned composers Esperanza Spalding, Margaret Brouwer and Du Yun with conversation catalysts Felipe Lara, Milica Paranosic, Miya Masaoka and Jeffrey Scott. Continue reading for more details on this exciting event celebrating living composers. Esperanza Spalding,four-time Grammy Award winner, is a composer, bassist, and vocalist, expansive, iterative, shape-shifting, open, and progressively innovative. The New York Times declared that she "has made her mark not just as a virtuoso jazz bassist or an effortlessly nimble singer but as an exotic hybrid of the two. The very nature of her talent is exceptional". In the past decade of her illustrious career, she has performed at the Oscars, the Grammys, the Nobel Prize ceremony, and several times at the White House, Spalding has continually and brilliantly married genres, pushed boundaries, and created groundbreaking work. Just 31 and with these accomplishments behind her, she is on a lifelong artistic journey which began while watching Yo-Yo Ma on an episode of Mister Rogers' Neighborhood. Her first instrument was the violin and she was playing with the Chamber Music Society of Oregon in her hometown of Portland at the age of five.Eventually her focus shifted to composing and playing acoustic bass. Spalding joined her first band, Noise for Pretend, as both bassist and vocalist.Eventually she moved to the east coast, graduated from the Berklee College of Music at age 20, and became the school's youngest-ever instructor. A voracious and magnetic performer, Spalding has shared the stage with her own revolving ensembles, Herbie Hancock, Stevie Wonder, Janelle Monae, and Prince, among others. Her recorded catalog features seven collaborative and five solo albums, the most recent of which is Emily's D+Evolution on the Concord label. Margaret Brouwer is known for creating music that abounds in lyricism, strong imagery and emotional power. The Dallas Morning News declared she "has one of the most delicate ears and inventive imaginations among contemporary American composers." Reviewing her 2014 Naxos CD, released as part of the label's American Classics Series, NewMusicBox wrote, "From the relentless, primal energy of 'Shattered Glass' to the naked beauty of 'Whom do you call angel now? '…Brouwer's music represents just how uniquely diverse the output and voice of a single composer can be." Reviewing the same disc, The Classical Reviewer stated that the composer "has an ear for creating some exquisite sounds and textures that listeners will find beguiling." Among the ensembles to champion her works are the St. Paul Chamber Orchestra, the Dallas Symphony, the American Composers Orchestra, CityMusic Cleveland and the American Modern Ensemble, and she has served as composer-in-residence of the Cabrillo Music Festival. In March 2017 Brouwer's Pluto for orchestra and chorus receives multiple performances with the Maryland Symphony. She is the founder of the Blue Streak Ensemble which brings innovative and eclectic music to new audiences across the country. The Margaret Brouwer Collection, containing her scores, manuscripts, papers and recordings, was created by the Music Division of The New York Public Library for the Performing Arts at Lincoln Center in 2015. Brouwer served as head of the composition department at the Cleveland Institute of Music from 1996 to 2008. Du Yun, born and raised in Shanghai, China, and currently based in New York, is a composer, multi-instrumentalist, performance artist, and activist for new music, working at the intersection of orchestral, opera, chamber music, theatre, cabaret, pop music, oral tradition, visual arts, electronics and noise. Hailed by the New York Times "as a leading figure in China's new generation of composers", she was selected by the National Public Radio as one of its 100 Composers Under 40, featured as One of the Top Creatives by Origin Magazine in 2015, and her opera Angel's Bone received its world premiere as part of the 2016 Protoype Festival. The Financial Times characterizes her work as "riveting...a significant voice". Chameleonic in her protean artistic outputs, Du's music is championed by some of today's finest performing artists, ensembles, orchestras and organizations including the BAM Next Wave Festival, the Seattle Symphony, the Detroit Symphony, Matt Haimovitz and Claire Chase. In addition, she has also made works in the art world, including the 4th Guangzhou Art Triennial, Sharjah Biennial (UAE), Auckland Triennial, Istanbul Biennial, and the inaugural Shanghai Project under the curator Hans Ulrich Obrist and Youngwoo Lee. She is a member of the composition faculty at SUNY-Purchase, was a founding member of the International Contemporary Ensemble (ICE), and currently serves as the Artistic Director of MATA, a pioneering organization dedicated to commissioning and championing young composers from around the world. The first Dialogues took place on September 25, 2015 at the Dwyer Cultural Center. The theme for the inaugural year is "the impact of the arts in our society," and events will be scheduled in every borough. Composers Now founder and artistic director Tania León was recently featured in an interview on new music blogI Care If You Listen. Read the full article to learn what she has to say about Composers Now, Dialogues, and the future of music. In addition to the Dwyer Cultural Center, Composers Now is proud to collaborate with the International Communications Association, the Harlem Cultural Archives and the Harlem Arts Alliance.